Hi Everyone, as you can see I've been quite busy this week. For this project I used a 6x6 Easel card blank. The frames I used were Quickutz Frame 10. The die used was Memory Box Hopmeadow Circle which I inked using Cosmic Shimmer Mist. I glittered it using Cosmic Shimmer Glitter Jewels. The image is a new release from Magnolia Tilda called "Loves me, Loves me not " which I coloured using Copic markers. 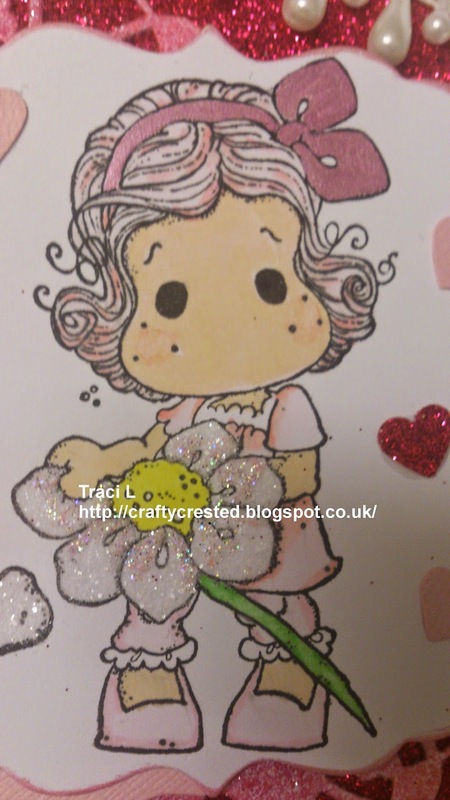 I added Stickles glitter to the daisy and I layered it up using pink Bazzill card and pink glitter card. I also added ribbon, pearls and embellishments. Lovely card, cute image! Thanks for playing along with us at Scrappind4Fun Challenges. Hope to see you again soon!! HUGS! Hi Traci a beautiful card, love the image. So pretty and cute. Thank you so much for sharing your creation with us at Creative Card Crew. So cute, really like the sparkly flower! Awww she is such a sweet image, great shaped card & love all the sparkle nice take on the Valentine chall. Thanks for sharing at Totally Tilda and Friends chall. wow this is very clever!!! Love the great sparkle to this. Love it! Such a sweet card! Love all the glitz. Thanks for joining us at Simply Magnolia. Thank you so much for sharing your lovely creation at Glitter n Sparkle. She is so adorable with Pink hair! Lovely card. Thank you for joining us at Midweek Magnolia's and good luck! Love this adorable image and such a gorgeous design. What a cute card! Love the colors and the embellishments! Thank you for joining the Crafts Galore Encore Use a Stamp or Digi February Challenge! Hope to see you again! Good luck! So cute, love her pink hair! Thanks for sharing with us at Totally Tilda and Friends. Thank you for your lovely entry at Scrapping4funChallenges. oh Tilda....she is just so adorable! Love your coloring and details on this one - beautiful card :) Thanks for playing along with us at Creative Card Crew!